Here are a few more stories from our last trip. 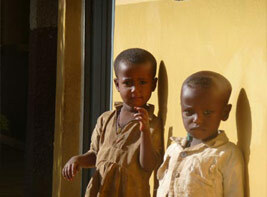 We spent Christmas 2007 in Ethiopia. Helping the Sisters prepare for the Christmas Mass, the head of baby Jesus fell off whilst setting up the nativity. Have to say this did cause a certain amount of giggling. We promised that on our next trip out we would bring back a new Jesus. We contacted The Daughters of Charity in London and asked where we could purchase a baby Jesus and as luck would have it they said that they had one and we were most welcome to it. Baby Jesus turned out to be a foot long with outstretched arms and made from fine porcelain. Not an easy thing to transport 3000 miles. We felt that it would be best suited for our travelling companion and friend Jane to have the responsibility of transporting Jesus, mainly because it would give us someone to blame if he suffered the same fate as his predecessor. We wrapped Jesus in bubble wrap (no swaddling clothes available) and Jane carried it lovingly in her arms. We lost count the times Jesus was mentioned on the journey, either asking how he was, where he was, the odd blasphemous remark or both. He was left behind on the table in the pizza restaurant at Heathrow, which resulted in ‘where is Jesus? Thanks to Jane he made it to Ethiopia in one piece and will have pride of place at the Christmas Nativity 2008. Some trips are not so good. Whilst out one late afternoon, a young lad about twelve, in torn clothes and no shoes ran up to us asking ‘Where you from’ ‘England’ came the reply. The lad now walking with us thought for a while and with a big smile said ‘RRRROONEY’. ‘Yes’ we said ‘Rooney he is from England’. The smile on the lads face increased with the fact that he had made himself understood and was getting very excited repeating ‘RRRROONEY’ over and over again and looking at us rather than looking where he was going. After repeating ‘RRRROONEY’ several times and getting more and more excited running around us he then stubbed his foot on a rock and tripped over. Mike slightly agitated by the persistent Rooney chants went into a fit of laughter at the sight of the lad tripping over. Aweke who was also walking with us broke down in tears of laughter at the sight of Mike in hysterics. However the raucous laughter soon turned to concern when we looked at the lad now in tears, him with pain, blood pouring from his foot and his toe nail hanging by a thread. Angie rushed to the lad’s aid with clean tissues and proceeded to wrap his foot and wipe away the tears. Mike and Aweke now full of remorse/guilt started to console the lad trying to avert the glaring gaze of Angie. With a face now streaked by tears as Angie washed away the dirt, a smile appeared due to the attention he was receiving. This smile increased with the offer of two boiled sweets. The lad left us at this point limping away at speed, still chanting RRRROONEY, only this time with two boiled sweets in his mouth, it doesn’t bear thinking about!